This product is protected via iLok. An iLok dongle is however optional for authorization. With the new iLok License Manager, you can deposit your license either on a 'computer' or on the iLok USB dongle, the choice is yours. iLok keys can be purchased from the iLok Store or from your local dealer. 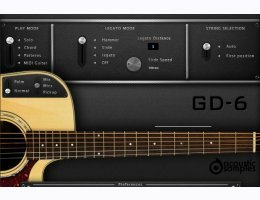 The GD-6 Acoustic Guitar is based on a Guild D-40 custom edition electro-acoustic guitar. We recorded it with a pair of microphones and using the built in pickup. We sampled it very deeply, all frets of all strings with upstrokes, downstrokes, round robins, releases, staccatos, mutes, palm mutes, hand blocks, slides, hammer ons, pull offs, retriggers, fretnoises, percussions other articulations. All of these details allow us to reproduce the real playing of a guitar player, and easily. There are basically 4 modes (that you can choose using keyswitches, G5 to C6), the solo mode that allows to play melodies, the chord mode that helps playing strums or picking very easily, the patterns mode that does all of the strumming or picking for you and the MIDI mode that allows you to use your preffered midi guitar controler.